A Phillies fan avoids a scare in the second inning. On Tuesday night, the Phillies failed to put a run on the board for rookie pitcher Aaron Nola, who looked very good in his debut despite picking up the hard-luck loss, 1-0. Why didn't Mackanin bench Herrera for lack of hustle? Naturally, the Phillies wasted no time putting some runs on the board Wednesday for another rookie pitcher, Adam Morgan, who started the series finale against the Rays. The Phillies plated two runs in the first inning, matching their hit total from last night's game (4) in that inning alone. Then, in the second inning, left fielder Cody Asche lost the grip on the bat, sending it flying into the first row behind the Phillies dugout. Luckily, no one was injured -- at least not seriously -- thanks to the quick reflexes of one fan. Maybe a little more pine tar next time, Cody? 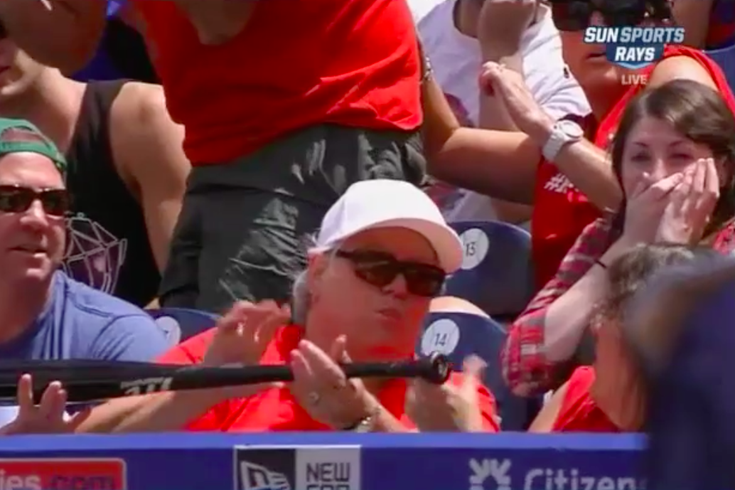 In all seriousness, those fans are lucky it wasn't a broken bat. Remember what happened last month, when a Red Sox fan was struck with the sharp end of a broken bat and spent nearly a week in the hospital?